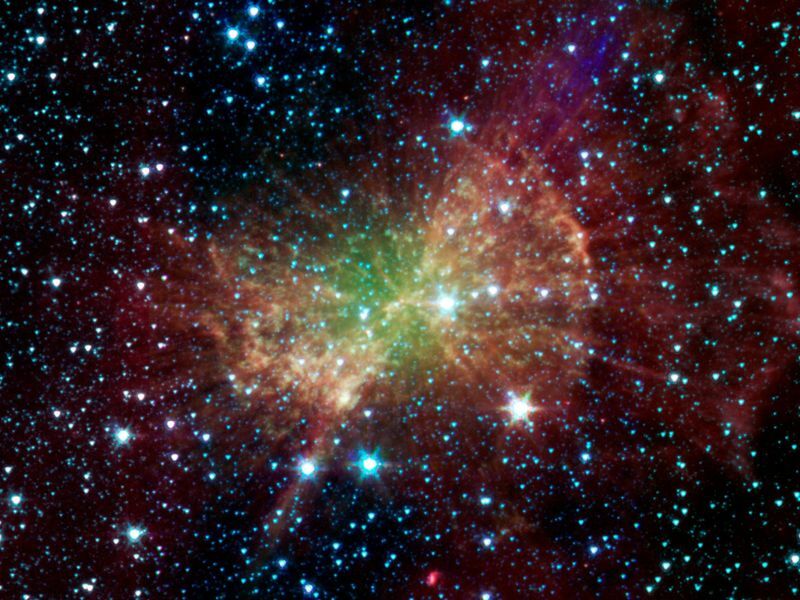 The "Dumbbell nebula," also known as Messier 27, pumps out infrared light in this image from NASA's Spitzer Space Telescope. The nebula was named after its resemblance to a dumbbell as seen in visible light. It was discovered in 1764 by Charles Messier, who included it as the 27th member of his famous catalog of nebulous objects. Though he did not know it at the time, this was the first in a class of objects, now known as "planetary nebulae," to make it into the catalog. Planetary nebulae, historically named for their resemblance to gas-giant planets, are now known to be the remains of stars that once looked a lot like our sun. When sun-like stars die, they puff out their outer gaseous layers. These layers are heated by the hot core of the dead star, called a white dwarf, and shine with infrared and visible-light colors. Our own sun will blossom into a planetary nebula when it dies in about five billion years. The Dumbbell nebula is 1,360 light-years away in the Vulpecula constellation, and stretches across 4.5 light-years of space. That would more that fill the space between our sun and the nearest star, and it demonstrates how effective planetary nebulae are at returning much of a star's material back to interstellar space at the end of their lives. 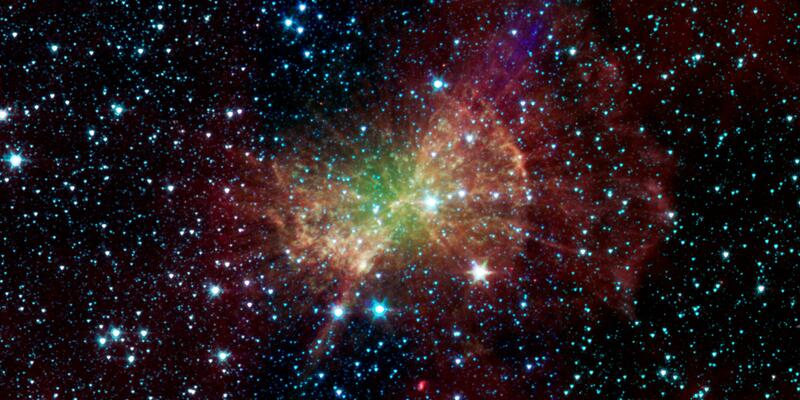 Spitzer's infrared view shows a different side of this recycled stellar material. 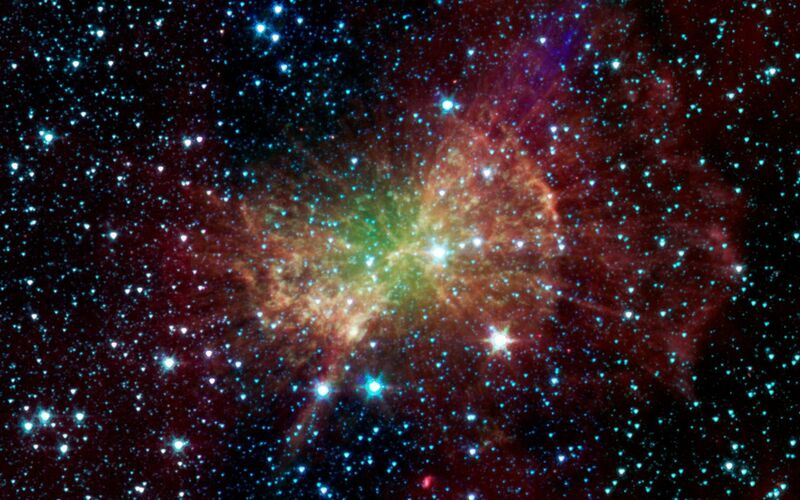 The diffuse green glow, which is brightest near the center, is probably from hot gas atoms being heated by the ultraviolet light from the central white dwarf. A collection of clumps fill the central part of the nebula, and red-colored radial spokes extend well beyond. Astronomers think these features represent molecules of hydrogen gas, mixed with traces of heavier elements. Despite being broken apart by the ultraviolet light from the central white dwarf, much of this molecular material may survive intact and mix back into interstellar gas clouds, helping to fuel the next generation of stars. Similar structures are seen in the Helix and other planetary nebulae. 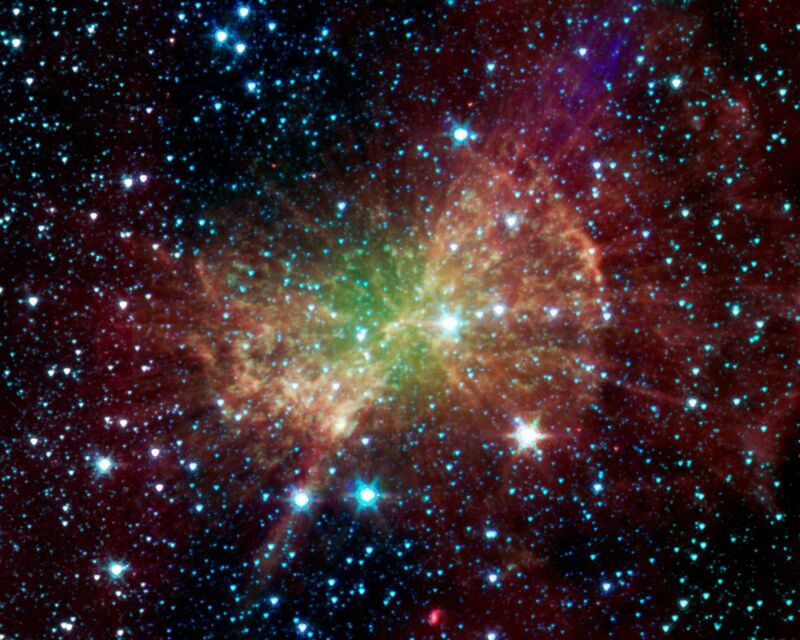 This image was made using data from Spitzer's infrared array camera. Blue shows infrared light with wavelengths of 3.6 microns, green represents 4.5-micron light and red, 8.0-micron light.